LINCOLN SQUARE — Grand Tour, set to open Thursday in Lincoln Square, has found a way around the great date-night dining-out debate — Italian? Thai? Mexican? — by offering a sampling of pretty much every cuisine on the planet. "It's kind of like being able to eat in seven or eight countries at one time," said executive chef Roger Herring, late of Lakeview's Socca. The concept, as pitched to Herring by owner Jesse Boyle, was to create a restaurant that would mimic the experience of the post-college backpacking "grand tour" through Europe. "Originally we thought we would do a bunch of classic dishes from those countries," Herring said. 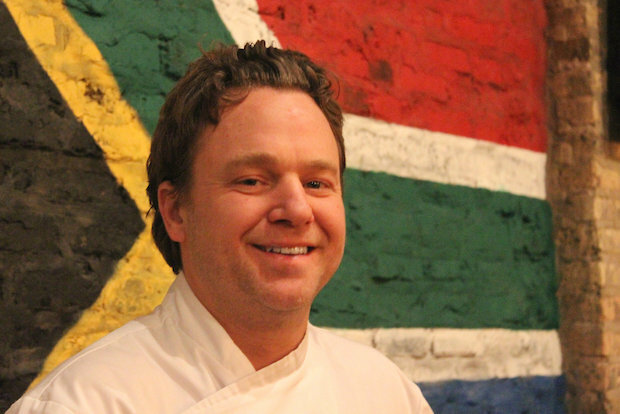 The chef, who has traveled extensively and worked in far-flung locations like Oprah Winfrey's school in South Africa, quickly expanded the menu's reach to encompass cuisine from Iceland to Jamaica. "We can do anything," he said. Herring spent the past six months fine-tuning Grand Tour's initial offerings with Matt Cyr, his chef de cuisine. The pair hit upon a slate of small and large plates, as well as snacks, that doesn't so much imitate as riff on traditional dishes. For example, on a recent trip to Malaysia, Herring couldn't get enough of the fried calamari tossed in duck egg sauce that's served as street food. His translation of the dish for Grand Tour's menu: sweetbreads in a spicy peanut butter sauce with Thai chili. In the same vein, Italy's classic gnocchi is reinterpreted with squid ink. "It's more 'inspired by,'" Herring said of his approach. "We're not going to try to make the best German sausage when there are people here who have been doing that for 60 years." During the restaurant's soft-open phase, a braised pig's head (China) — edible from "skin to snout" — has proven an instant hit with diners. "It's one of those things that on the weekend we'll hopefully sell out of every night," said the chef. The interaction the dish encourages between server and patrons, and between tables of diners, further plays into the grand tour theme of a group of travelers gathering around a communal meal. "We're trying to create that shared atmosphere," Herring said. Diners should beware of growing too attached to any one menu item though. The selection will change quarterly, at a minimum. Each month, the restaurant will also offer a prix fixe tour of a single country. Patrons have a handful of days remaining to order February's Canadian tour (poutine, salmon, maple dessert) before it gives way to Ireland in March. "The style of the food is going to change all the time, it's not going to get stale," said Herring. Just as with a grand tour, he added, the food is intended to feel unexpected, like never knowing what's around the corner. If that's not enough variety, look for daily chalkboard specials to eventually join the mix. "Right now everything is new and special," Herring said. The clear emphasis on food should assuage those neighbors initially concerned that Grand Tour, 2434 W. Montrose Ave., would simply pick up where the previous occupant left off. When Boyle and his business partners introduced the Grand Tour concept at a community meeting in February 2013, residents complained about the former Paddy O'Splaines' practice of hiring promoters to bring in busloads of rowdy patrons. Mention of Grand Tour's circular bar and the owners' intention of becoming a hub for soccer and rugby fans raised additional red flags with neighbors wary of sports bars, as did the news that Jim Cornelison, official national anthem singer for the Chicago Blackhawks, is an investor in the Montrose property. Pat Doerr, a partner in the venture, was quick to clarify. "This is a restaurant with bar seating," he said. "Far more than half the revenue will be food, 85 percent of the seating is restaurant seating." The finished restaurant — featuring high-end finishes like a slate fireplace and beams of reclaimed timber — bears out that claim. In Grand Tour's main dining room, the vast majority of the 120 seats are clustered in tables of four and on a long plaid banquette against the east wall, with minimal perches surrounding the bar. An area for private events in the rear of the building can accommodate another 40 or so people. When not reserved, its shuffleboard and foosball table will be available to anyone who wants to play. "It's kind of hearty and chunky," Herring said of the decor. "It has a feeling of being serious but still super casual." At opening, Grand Tour is limited to dinner service, with plans to add weekend brunch; lunch will follow down the road. Still waiting on its liquor license, the restaurant is also BYOB for the moment. The restaurant's grand opening will feature a taste of the live music to come: Twilight Combination will play Thursday night, the Marquis Brothers on Friday and the Tinker Boys on Saturday.